Clovis Oncology, Inc. and OvaScience, Inc. were subject to substantially similar shareholder derivative lawsuits brought by the same law firm. The lawsuits alleged that non-employee directors breached their fiduciary duties to shareholders by awarding themselves “excessive” compensation under non-shareholder approved equity plans2 and policies that included no director pay limits. Plaintiffs support this claim by alleging that the non-employee directors’ average compensation significantly exceeded the median non-employee director compensation paid by peer companies. In Clovis and OvaScience, plaintiffs claimed that multi-year average compensation paid to non-employee directors exceeded the median by 214% and 75%, respectively. The Clovis and OvaScience cases follow a string of similar cases heard by the Delaware courts since 2012. None of these cases have reached a decision on the merits. However, procedural rulings by the Delaware courts suggest that a corporate board’s decision on its own pay will be evaluated under the deferential “business judgment rule” if such pay is subject to “meaningful limits” (see Meridian Client Updates dated December 4, 2012, August 19, 2014, May 22, 2015). 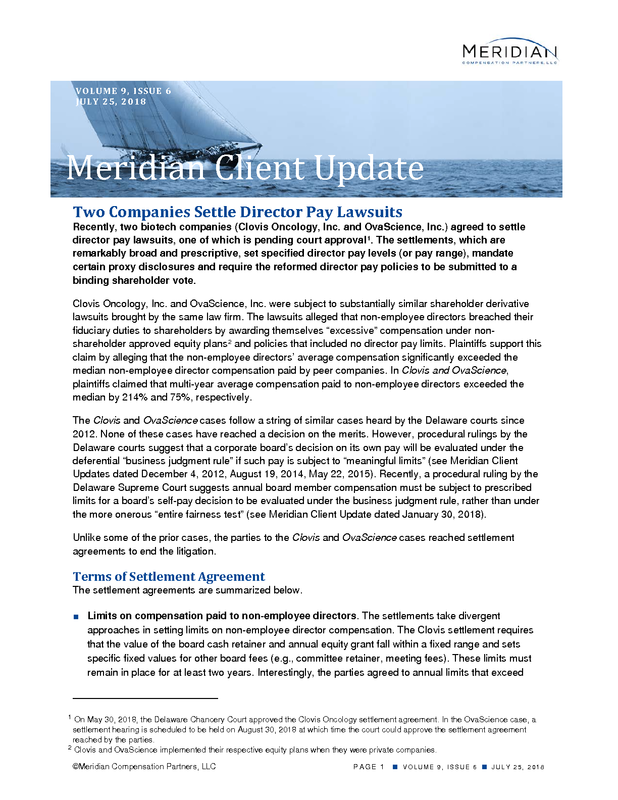 Recently, a procedural ruling by the Delaware Supreme Court suggests annual board member compensation must be subject to prescribed limits for a board’s self-pay decision to be evaluated under the business judgment rule, rather than under the more onerous “entire fairness test” (see Meridian Client Update dated January 30, 2018). Unlike some of the prior cases, the parties to the Clovis and OvaScience cases reached settlement agreements to end the litigation. The settlement agreements are summarized below. ■ Limits on compensation paid to non-employee directors. The settlements take divergent approaches in setting limits on non-employee director compensation. 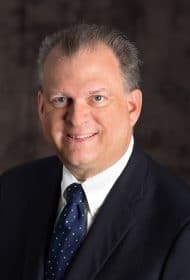 The Clovis settlement requires that the value of the board cash retainer and annual equity grant fall within a fixed range and sets specific fixed values for other board fees (e.g., committee retainer, meeting fees). These limits must remain in place for at least two years. Interestingly, the parties agreed to annual limits that exceed Clovis Oncology’s five-year average director pay of $429,000, which the plaintiffs had claimed was excessive. The OvaScience settlement subjects non-employee director compensation to an annual dollar cap, which must remain in place for at least three years. See the appendix to this Client Update for details regarding the foregoing non-employee director compensation requirements. ■ Shareholder approval of reformed non-employee director pay policy. Each settlement requires a binding shareholder vote on the reformed non-employee director compensation policies at Clovis’ and OvaScience’s respective 2018 Annual Shareholders Meeting. ■ Process for setting director compensation and disclosure of same. Both settlements require each company’s Board of Directors to consider peer benchmarking data and current best practices before making any changes to their respective director compensation policies. In addition, the Clovis settlement agreement requires Clovis’ Board of Directors to annually review the peer group used to benchmark non-employee director pay levels. Both settlement agreements also require proxy disclosure of the process used to set non-employee director compensation and the component companies of the peer group used to benchmark director compensation. ■ Stock ownership and share holding requirements. The Clovis settlement requires the implementation of a mandatory stock ownership requirement (which must remain in effect for at least five years) and both settlement agreements impose share holding requirements, which must remain in effect for five years and three years for Clovis and OvaScience, respectively. ■ Payment of attorney fees and expenses. As would be expected, the settlement agreements require Clovis and OvaScience to pay plaintiffs’ legal fees and related expenses. OvaScience agreed to pay up to $300,000 in attorney fees and expenses under its settlement agreement. The amount of legal fees and expenses to be paid by Clovis is subject to further court negotiation. As required by the settlement agreements, Clovis and OvaScience each submitted a proposal to their respective shareholders seeking approval of the reformed non-employee director compensation policies. Institutional Shareholder Services (ISS) recommended shareholders vote FOR OvaScience’s proposal and AGAINST Clovis’ proposal on their respective non-employee director compensation policies. In support of its AGAINST recommendation, ISS noted that Clovis’ director pay levels were high relative to pay for directors of mid-cap S&P 400 companies in the same GICs industry group as Clovis. Ultimately, OvaScience’s proposal was approved by its shareholders (with 95% voting FOR the proposal), while Clovis’ proposal was voted down by its shareholders (with 58% voting AGAINST the proposal). Clovis’ settlement agreement does not cover the effects of such a vote outcome. Meridian Comment. The Clovis and OvaScience cases may embolden the plaintiffs’ securities bar to bring additional strike suits challenging public companies’ director pay practices. However, companies may mitigate the risk of such suits, by including in equity plans shareholder-approved limits on non-employee director compensation and by expanding proxy disclosures to cover director pay philosophy, the peer group used for benchmarking and the decision-making process for setting director pay levels. The Clovis and OvaScience cases also offer a cautionary tale for pre-IPO companies. Newly public companies often maintain legacy practices for a time after going public, including fixed option/share grants to non-employee directors (in the case of Clovis and OvaScience, each non-employee director received a fixed annual grant of 10,000 and 12,000 stock options, respectively). This may lead to high compensation levels relative to other public companies of similar revenue size in similar industries. In addition, newly public companies often maintain a non-shareholder approved equity plan for a considerable period after the IPO. These practices may increase the susceptibility of IPO companies being a target of a strike suit challenging director compensation. 1 On May 30, 2018, the Delaware Chancery Court approved the Clovis Oncology settlement agreement. In the OvaScience case, a settlement hearing is scheduled to be held on August 30, 2018 at which time the court could approve the settlement agreement reached by the parties. 2 Clovis and OvaScience implemented their respective equity plans when they were private companies. 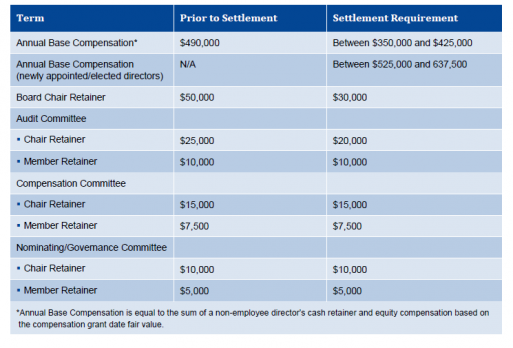 The chart below details the key elements of the non-employee director compensation policies agreed to under the Clovis settlement. 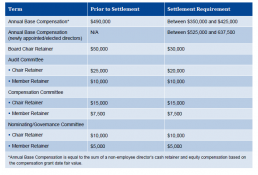 The chart below details the key elements of the non-employee director compensation policies agreed to under the OvaScience settlement.